(CNN) -- A floating city off the coast of San Francisco may sound like science fiction, but it could be reality in the not-too-distant future. The Seasteading Institute has drawn up plans for a floating city off the coast of San Francisco. Friedman said the floating city may be built in modular pieces so that city blocks and neighborhoods can be recombined to create new urban layouts. The idea of building cities on the sea is not new, he said, but the Seasteading Institute has come closer to realizing the goal than others. "A lot of people over the past hundred plus years have had this idea and even specifically building cities on the ocean to try out new forms of government," he said. "But they've pretty much been totally imagined and if they did try, they totally failed." There are several unknowns about future attempts to create floating cities, said Christian Cermelli, an engineer and architect with Marine Innovation and Technology, based in San Francisco. Cermelli, who is part of a team of designers creating a blueprint for the first seastead, said it's unclear if construction is possible -- or what it would cost. Still, a prototype for the idea may be finished in as little as three years, he said. Friedman said seasteads are loosely based on oil rigs, but with important modifications. "We care more about sunlight and open space, so the specifications are different," he said. "Also, oil platforms are fixed in place. We think it's important to have more modular cities. So you would build a city out of buildings that can actually be separated and rearranged." Cermelli said the ocean cities may use technology from suspension bridges "to expand the space at sea and basically get a roomier platform." 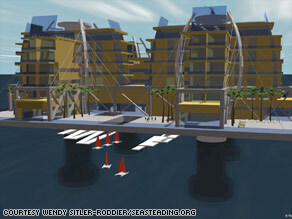 Friedman says the idea of seasteading has met a range of reactions. "Some people think we're crazy. A lot of people think we're crazy," he said. "Some people think terrible things could happen, others think it would be great." About 600 people have joined the Seasteading Institute. Some of them, like Gayle Young, say the idea is exciting partly because it's so different. "I love the idea because it's audacious. It's big," she said. "It's about pushing frontiers."